A couple of social outings, plus a stupid parking ticket added to my expenses. Of course, a fair chunk of my income went towards my holiday too instead of towards my savings. So how did this month go? A savings rate of 31.1%, so not too bad, I guess. This takes my average down to 46.4%. I think if I can keep my average above 40% by the end of the year, I’ll be happy, especially knowing how the expensive the end of the year will get. This month’s savings was topped up with £20.02 from InboxPounds*, £6.34 reviewing music (and occasionally, ladies fashion!) with SliceMyPie*, £5.74 from TopCashBack* and £100 from rent received. My Future Fund now stands at £56,294.82, a seemingly huge jump from last month but this was due to my stakeholder pension being transferred into one of my SIPPs. Without the transfer, the balance would be £44,908.29 – an increase of over £2.5k from last month, due to the global market stabilising a little. Net Worth is now £113,389.32, an increase of 27% so far from the start of the year. Incidentally, this is the last month I paid into my stakeholder (the direct debit came out just before the transfer). I have now set up a standing order to pay into my SIPP for the same amount from November. I received £5.54 from Amlin, £5.93 from Diageo, £7.79 from GlaxoSmithKline, £2.36 from Land Securities Group, and £3.01 from Standard Chartered. So a total of £24.63, bringing my monthly average now to £25.39. 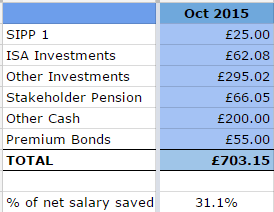 In October 2014, my total dividend income was just £3.80, so another great increase! Dividends received in 2015 now total £253.90. With Amlin soon to be bought out, I decided to start investing in another similar insurance company, namely Lancashire Holdings Ltd. When I receive my funds from the Amlin sale, I think I’ll use it to build up my investment trust holdings, although I’m not yet sure if it will be a top up of existing investments or new holdings. 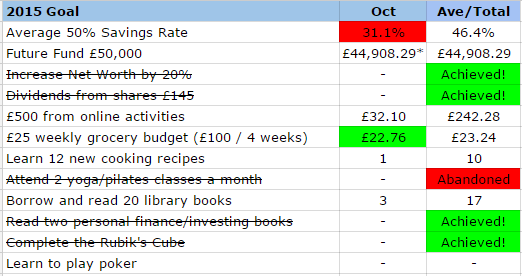 Food/Groceries Budget – I spent £113.78 this month, averaging £22.76 per week. My average weekly spend so far is now £23.24 so still on target. Cooking Recipes – I made a roast chicken dinner – I know…it seems absolutely mad that I’ve never done this before but this was my first time! Online Earnings – Still plugging away at this bit by bit, with amounts coming in from InboxPounds, SlicethePie and TopCashback as listed above, bringing my total online earnings so far this year to £242.28. I have around £140 in the cashback pipeline, but it looks like most of it won’t get paid til next year so won’t count towards my goal. Library books – Three books borrowed and read this month. 17 books borrowed so far, so on track to hit my target of 20 library books by the end of the year. If anyone’s interested, I track all my reading via GoodReads – add me as a ‘friend’ if you are a member! This will be my last update while working for my current company as I will very shortly be working for New Co when the sale finally takes place, just 2 weeks short of my 20 years’ service! I’ve been told I will get continuous service – I wonder if I’ll get anything for it though? Hope you all had a good October! Nice figures Weenie, well done. Quick question though. You quoted savings rate is as a % of your net salary but you've listed some pension and SIPP bits above it. Do your savings rate calculations count the tax relief on the pension portions? No, my calculation doesn't include tax relief – I don't see the relief as me actually 'saving' anything. Nor does it include the amount taken from my gross salary for my company pension. I see the pension amount in the same light as my NI (which is essentially an amount paid towards my state pension) and since I wasn't going to include that in my savings rate, I only calculate using my net salary, the amount that hits my bank account and go by what I choose to do with it once it's in my account, ie save/invest or spend. If I included both tax relief and my company pension, I'd be hitting 50% a lot of the time and ultimately, perhaps be led into thinking I was ahead of the game and not try as hard. It does mean it's more of a challenge to achieve my goal of 50% but I prefer it that way. Much in the same way that people calculate their net worths in different ways, savings rates are the same – as long as you are consistent in your own calculations, I don't think it really matters. 50% saving goal is really amazing. I wish I could save so much one day. Though I m paying myself first but still long way to go to achieve 50% target savings. A great effort weenie..
Another solid month. 30%+ while saving for a holiday, boooom! Save, save, save. A 27% increase in NW is amazing. 30% is still pretty solid, the 50% savings goal is a really good one to try to achieve for sure but 30% is nothing to feel bad about. Great numbers all around I think. Keep up the great work. It must be satisfying to see your savings grow like this. I wish I'd done similar when I started out twenty odd years ago, but I was taking a more "traditional" approach of saving a fixed monthly amount. Anything left over I tended to spend! I console myself with the fact that at least I got the fundamental right: I was saving consistently every month into an index tracker. It still amazes me today that this probably put me into a big minority of the population! 50% is the average target that I'm aiming for – I think it's a good goal as it's not easy to do at all and yet if you do, it's a big chuck to save! I think I average around 40% though, which is still good. Thanks for stopping by and good luck with your savings. It is quite satisfying to see my savings grow like this…but only if I remind myself how far I've come! Otherwise, month on month, all I see are tiny little increases (and sometimes decreases) and it feels sooooo slow and tedious! Your plan of saving a fixed amount has obviously worked as you are living the FI life right now, way before NRA – well done you! Thanks Tawcan – I'll keep plugging away. 30% has been really difficult to get and I'm not sure I'll manage it in November but I'll be trying my best! As I said to Tawcan, 30% was really hard to get and I think I'll struggle to get that in November, as you rightly pointed out, it's coming up to silly season! Am really chuffed with the NW increase, thanks! A good October from you. Well done. Continuous service ought to be worth something if you do end up getting made redundant but it depends on whether or not they're the kind of company that will play fair. Thanks Cerridwen. I think regarding work, I need to prepare for the worst and hope for the best. I normally get to see the neighbours' fireworks displays (from the comfort of my bedroom window!) but I was at the gym after work so only caught the end as I got home! Congratulations on another great month – saving over 30% and still paying out towards the holiday is a huge achievement, lets face it the vast majority of the population save less than 10% on a good day! A good October! Shame your savings rate was down somewhat. I've been suffering from a similar malaise with my expenses of late! Great to see such a thumping increase year-on-year with your October dividend income. Hopefully see the same for 2016! Thanks. I can be fairly strict with the grocery spending as most of the time, I'm only cooking for one. But I do have to make a list otherwise it's easy to fall back on just putting things randomly in my shopping trolley! I loosely plan my meals for the week, although I do plan for all my lunches that I take to work, it's just easier that way and one less thing to ponder on each day! My grocery costs have been reduced partly because since I started home brewing a year ago, I haven't bought any alcohol to drink at home! Although I drink less at home than I used to, the costs still added up but I'm still enjoying my homebrewing so long may that continue! Thanks for stopping by! Yeah, my savings rate will continue to drop as I put money aside for my holiday but normality should resume early next year and my savings rate should be looking a lot healthier. Yes, I'm enjoying seeing the year-on-year comparisons in my dividend income and should be seeing greater increases as I tweak my investment strategy! Thanks for the kind wishes and for stopping by. Yes, I shall be enjoying myself during Christmas! 31% of Net salary is fantastic weenie! I always include the Tax bonus when I get it and also the employer contributions to pension. 2. Same as with the SIPP. This is totally optional. If I didn't put money in the SIPP I wouldn't get the tax back, so this is "work" I am doing to get that money back and using it to invest which I wouldn't otherwise have if I didn't set up my SIPP and pay money into it. 3. Ultimately all of the above is money going into your Net Worth so it should count as savings IMO. Maybe there is a middle ground where we can track both but base our main savings targets on Net salary… to get the best of both worlds? I get what you're saying and when I read your updates, it makes sense to me what you are doing. However, I just decided to keep things simple (in my mind) by not including the employer contributions and the tax relief – it just seemed easier to just look at what hits my bank account and then work off my savings rate from that. I guess it does mean I'm kind of short-changing myself in terms of savings rate but I'm ok with that, just makes it harder and more of a challenge! You would be kicking my a$$ on savings rate if we both compared using the same method, that is for sure!